Blouse by Looxent. 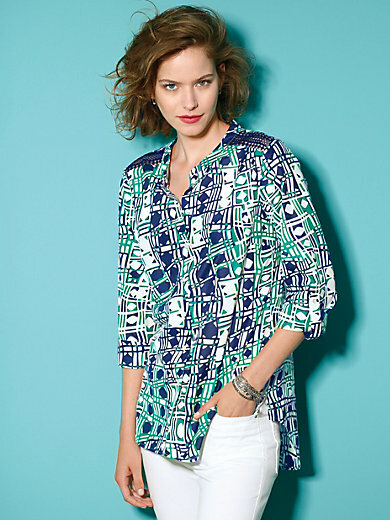 Tunic style shape with full length button facing. The exclusive "Neo Graphics" LOOXENT print looks particularly summery and bang on-trend on the silky woven fabric! The crocheted inserts on the shoulder make stylish accents. Cut in a longer length, with a pleat at the back and a rounded hem. Longer at the back. In 68% cotton, 32% silk. Length approx. 30ins. The blouse is machine washable.